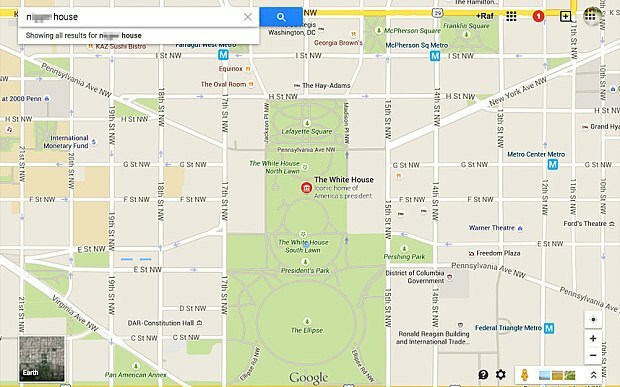 Typing the racial slur "n***** house" into the search bar of Google Maps and Google Maps UK lead to 1600 Pennsylvania Avenue - The White House, home to President Barack Obama. Google has fixed and apologized for the offensive mistake, of which they have yet find the source. Whether a vandal or a Google employee is responsible for the deplorable "joke," we're also wondering how this prank was discovered in the first place. Who types "n***** house" into Google Maps? This is not the first time Google Maps accidentally hosted inappropriate gestures. Since releasing the Map Maker tool which allowed the public to make edits, Google Maps has had a tough time keeping vandals out of their system. For instance, someone attempted to express their opinion about the Apple vs. Android rivalry by using the Map Maker tool to draw a robot peeing on an apple near Rawalpindi, Pakistan. Google shut down Map Maker in response.